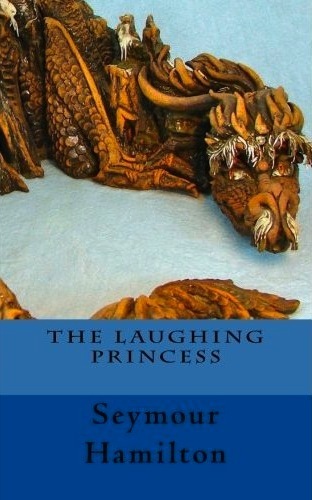 The Laughing Princess is Seymour Hamilton’s enchanting foray into something like fairy tales. Petra and Daniel, a brother and a sister, meet a dragon who tells them a series of bewilderingly surprising stories from the lore of the more-magical-than-it-seems village where they’re vacationing. After much suspense, the audiobook is now available for free download! Go to Podiobooks.com and listen online, or right-click on the files at the bottom of the page to take your own mp3 with you, wherever you like, free of charge. Enjoy! I took this opportunity to ask Seymour some questions about his unique little book. I know The Laughing Princess was inspired by some wonderful dragon sculptures, the first of which you met at Exceptional Pass. Did you base the stories on existing dragon folklore, or is the dragon-filled village by the sea of The Laughing Princess your own creation? It’s all me, but it’s also all that I’ve read. The stories were amazingly easy to write. I had to edit and polish them, but not much, which tells me that I had to be mining a rich vein of magic that has been refined over millennia of story-telling. People who like fairy stories will recognize time-honoured magical ideas such as the power of the number seven — the stone Daniel skips seven times and the woman with seven sons. The over-the-top revenge-justice that some of the dragons mete out is a staple of fairy tales, though hardly what I would endorse as good jurisprudence. The intertwining of the stories made them satisfying to write, and unlike the chaotic world in which we live. Exceptional Pass was the magic casement through which I looked into a fairy land forlorn, thanks to a few hours with people whose imaginations were unfettered by the literal world in which we live most of our lives, the most important of whom was Pamela Nagley Stevenson, creator of ceramic dragons with marvelous names. Significantly, I was living near mountains which are so unreal that a flight of dragons at sunset would not be a surprise. I’m sure it also helped that I’ve met many dragons in Ursula LeGuin’s Earthsea, in Patricia Wrede’s Enchanted Forest, in Ann McCaffrey’s Pern, not to mention a gyre of splendid winged creatures in the history, myths, legends, lore and heraldry of England, Scotland and (especially) Wessex and Wales, which have their own special kind of dragon, the two-footed Wyvern. Are the stories interrelated beyond their setting? What was your process for putting them in order? The stories happened pretty much in that order. I wrote “Elemental Exchange” first, then The Littlest Dragon took over the duty of storyteller and after that, one thing led to another. As the stories unfolded, it became clear that three of the seven sons would be meeting very different dragons, that the Witch and Peder had been friends, that the Princess grew up to be a great and good Queen, that not all stories end happily, and that Dragons are still making their magic for those lucky enough to meet them. I notice a lot of strong women characters in this book, and a few really nasty men. Is The Laughing Princess a purposeful monument to women’s empowerment? In the main, the characters seem to me to be independent people who take responsibility for their actions, whatever their gender — or species. The exceptions are the (male) Warrior, who is conscienceless, the Sea Rover who is an unspeakably cruel man, and Ryll, who is female but has characteristics even the most ardent feminist would despise. The Princess, later Queen, is strong, female, admirable and shares the Dragon Ke-Au-Ka Ida’s decidedly feminine wisdom. The dragon Kaiwheil Bhagmani-Ji is also female, but she is a shy and kindly healer of troubled artistic souls. However, the dragon Pu Ahi Oheo Wythe is both female and dreadfully drastic. I really don’t know the gender of the Boulder Roller Dragon, or for that matter the hard-hearted and soulless dragon Aina Lani Kahu Wellan, although Santosh Raal-Zurmath seems male to me, as is Ena Pingala Kythe, who makes a decidedly macho claim to be beyond the comprehension of even his fellow elementals. I’m not sure about the Littlest Dragon, but I have a hunch that he’s a she. So, enough analysis, already! Next you’ll be asking me what the moral of each story is, and we all know that the search for a moral destroys any magic a story might possess. The Danes have the right idea. Instead of importing moral messages into the stories of Hans Christian Anderson, they brought The Little Mermaid out of his story into our world and sat her on a rock in Copenhagen harbour.